In The Electrical Engineer of June 10, I have noted the description of some experiments of Prof. J. J. Thomson, on the “Electric Discharge in Vacuum Tubes,” and in your issue of June 24 Prof. Elihu Thomson describes an experiment of the same kind. The fundamental idea in these experiments is to set up an electromotive force in a vacuum tube — preferably devoid of any electrodes — by means of electro-magnetic induction, and to excite the tube in this manner. As I view the subject, I should think that to any experimenter who has carefully studied the problem confronting us and who has attempted to find a solution of it, this idea must present itself as naturally, as, for instance, the idea of replacing the tinfoil coatings of a Leyden jar by rarefied gas and exciting luminosity in the condenser thus obtained by repeatedly charging and discharging it. The idea being obvious, whatever merit there is in this line of investigation must depend upon the completeness of the study of the subject and the correctness of the observations. The following lines are not penned with any desire on my part to put myself on record as one who has performed similar experiments, but with a desire to assist other experimenters by pointing out certain peculiarities of the phenomena observed, which, to all appearances, have not been noted by Prof. J. J. Thomson, who, however, seems to have gone about systematically in his investigations, and who has been the first to make his results known. These peculiarities noted by me would seem to be at variance with the views of Prof. J. J. Thomson, and present the phenomena in a different light. My investigations in his line occupied me principally during the winter and spring of the past year. During this time many different experiments were performed, and in my exchanges of ideas on this subject with Mr. Alfred S. Brown, of the Western Union Telegraph Company, various different dispositions were suggested which were carried out by me in practice. Fig. 1 may serve as an example of one of the many forms of apparatus used. This consisted of a large glass tube sealed at one end and projecting into an ordinary incandescent lamp bulb. 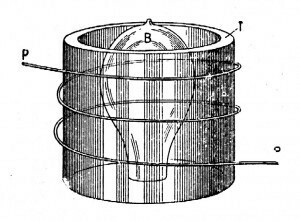 The primary, usually consisting of a few turns of thick, well-insulated copper sheet was inserted within the tube, the inside space of the bulb furnishing the secondary. This form of apparatus was arrived at after some experimenting and was used principally with the view of enabling me to place a polished reflecting surface in the inside of the tube, and for this purpose the last turn of the primary was covered with a thin silver sheet. In all forms of apparatus used there was no special difficulty in exciting a luminous circle or cylinder in proximity to the primary. As to the number of turns, I cannot quite understand why Prof. J. J. Thomson should think that a few turns were “quite sufficient,” but lest I should impute to him an opinion he may not have, I will add that I have gained this impression from the reading of the published abstracts of his lecture. Clearly, the number of turns which gives the best result in any case, is dependent on the dimensions of the apparatus, and, were it not for various considerations, one turn would always give the best result. I have found that it is preferable to use in these experiments an alternate current machine giving a moderate number of alternations per second to excite the induction coil for charging the Leyden jar which discharges through the primary — shown diagrammatically in Fig. 2, — as in such case, before the disruptive discharge takes place the tube or bulb is slightly excited and the formation of the luminous circle is decidedly facilitated. But I have also used a Wimshurst machine in some experiments. Prof. J. J. Thomson’s view of the phenomena under consideration seems to be that they are wholly due to electro-magnetic action. I was, at one time, of the same opinion, but upon carefully investigating the subject I was led to the conviction that they are more of an electrostatic nature. It must be remembered that in these experiments we have to deal with primary currents of an enormous frequency or rate of change and of high potential, and that the secondary conductor consists of a rarefied gas, and that under such conditions electrostatic effects must play an important part. In support of my view I will describe a few experiments made by me. To excite luminosity in the tube it is not absolutely necessary that the conductor should be closed. 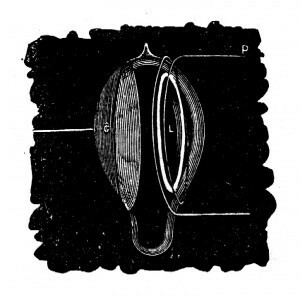 For instance, if an ordinary exhausted tube (preferably of large diameter) be surrounded by a spiral of thick copper wire serving as the primary, a feebly luminous spiral may be induced in the tube, roughly shown in Fig. 3. In one of these experiments a curious phenomenon was observed; namely, two intensely luminous circles, each of them close to a turn of the primary spiral, were formed inside of the tube, and I attributed this phenomenon to the existence of nodes on the primary. The circles were connected by a faint luminous spiral parallel to the primary and in close proximity to it. To produce this effect I have found it necessary to strain the jar to the utmost. The turns of the spiral tend to close and form circles, but this, of course, would be expected, and does not necessarily indicate an electro-magnetic effect; whereas the fact that a glow can be produced along the primary in the form of an open spiral argues for an electrostatic effect. In using Dr. Lodge’s recoil circuit, the electrostatic action is likewise apparent. The arrangement is illustrated in Fig. 4. 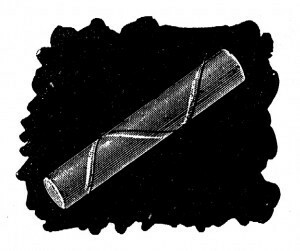 In his experiments two hollow exhausted tubes H H were slipped over the wires of the recoil circuit and upon discharging the jar in the usual manner luminosity was excited in the tubes. Another experiment performed is illustrated in Fig. 5. In this case an ordinary lamp-bulb was surrounded by one or two turns of thick copper wire P and the luminous circle L excited in the bulb by discharging the jar through the primary. The lamp-bulb was provided with a tinfoil coating on the side opposite to the primary and each time the tinfoil coating was connected to the ground or to a large object the luminosity of the circle was considerably increased. This was evidently due to electrostatic action. In other experiments I have noted that when the primary touches the glass the luminous circle is easier produced and is more sharply defined; but I have not noted that, generally speaking, the circles induced were very sharply defined, as Prof. J. J. Thomson has observed; on the contrary, in my experiments they were broad and often the whole of the bulb or tube was illuminated; and in one ease I have observed an intensely purplish glow, to which Prof. J. J. Thomson refers. But the circles were always in close proximity to the primary and were considerably easier produced when the latter was very close to the glass, much more so than would be expected assuming the action to be electromagnetic and considering the distance; and these facts speak for an electrostatic effect. Furthermore I have observed that there is a molecular bombardment in the plane of the luminous circle at right angles to the glass — supposing the circle to be in the plane of the primary — this bombardment being evident from the rapid heating of the glass near the primary. Were the bombardment not at right angles to the glass the heating could not be so rapid. If there is a circumferential movement of the molecules constituing the luminous circle, I have thought that it might be rendered manifest by placing within the tube or bulb, radially to the circle, a thin plate of mica coated with some phosphorescent material, and another such plate tangentially to the circle. If the molecules would move circumferentially, the former plate would be rendered more intensely phosphorescent. For want of time I have, however, not been able to perform the experiment. Another observation made by me was that when the specific inductive capacity of the medium between the primary and secondary is increased, the inductive effect is augmented. This is roughly illustrated in Fig. 6. 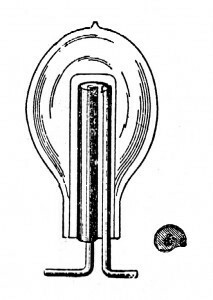 In this case luminosity was excited in an exhausted tube or bulb B and a glass tube T slipped between the primary and the bulb, when the effect pointed out was noted. Were the action wholly electromagnetic no change could possibly have been observed. I have likewise noted that when a bulb is surrounded by a wire closed upon itself and in the plane of the primary, the formation of the luminous circle within the bulb is not prevented. But if instead of the wire a broad strip of tinfoil is glued upon the bulb, the formation of the luminous band was prevented, because then the action was distributed over a greater surface. The effect of the closed tinfoil was no doubt of an electrostatic nature, for it presented a much greater resistance than the closed wire and produced therefore a much smaller electromagnetic effect. Some of the experiments of Prof. J. J. Thomson also would seem to show some electrostatic action. 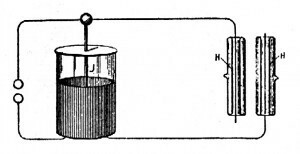 For instance, in the experiment with the bulb enclosed in a bell jar, I should think that when the latter is exhausted so far that the gas enclosed reaches the maximum conductivity, the formation of the circle in the bulb and jar is prevented because of the space surrounding the primary being highly conducting; when the jar is further exhausted the conductivity of the space around the primary diminishes and the circles appear necessarily first in the bell jar as the rarefied gas is nearer to the primary. But were the inductive effect very powerful they would probably appear in the bulb also. If, however, the bell jar were exhausted to the highest degree they would very likely show themselves in the bulb only, that is, supposing the vacuous space to be non-conducting. On the assumption that in these phenomena electrostatic actions are concerned we find it easily explicable why the introduction of mercury or the heating of the bulb prevents the formation of the luminous band or shorten the after-glow; and also why in some cases a platinum wire may prevent the excitation of the tube. Nevertheless some of the experiments of Prof. J. J. Thomson would seem to indicate an electro-magnetic effect. I may add that in one of my experiments in which a vacuum was produced in the Torricellian method, I was unable to produce the luminous band, but this may have been due to the weak exciting current employed. My principal argument is the following: I have experimentally proved that if the same discharge which is barely sufficient to excite a luminous band in the bulb when passed through the primary circuit be so directed as to exalt the electrostatic inductive effect — namely, by converting upwards — an exhausted tube, devoid of electrodes, may be excited at a distance of several feet.